The Ensembl team has been involved in several activities in Hyderabad (India) during the last few days, making the most of the latest HUGO’s 13th Human Genome (HGM2008). A satellite workshop has been organised within the Open Door Workshop framework at the Centre for Cellular and Molecular Biology (CCMB). 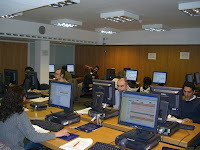 Over 40 scientists from different countries had the opportunity to learn about different resources freely available on the Internet, providing us with useful feedback. Following our presence in the HGM2008 in the EBI booth we had the opportunity to make several contacts that hopefully should allow us to organise a series of workshops around India next year. If you were interested to know more about this, or query about possibilities to host one of our workshops, you can contact us. As usual October is a busy month for the Ensembl trainers with workshops on 4(!) different continents. From 1-3 Oct Ensembl will feature in the Wellcome Trust Open Door Workshop “Working with the Human Genome Sequence” in Hyderabad, India, and from 6-8 Oct in the EBI hands-on workshop “A two-day dip into the EBI’s data resources: Understanding your data” in Hinxton, UK. If you want to know to which locations we are coming after October, then have a look at the complete list of all upcoming training events. Considering hosting an Ensembl workshop yourself? Please contact Xose Fernandez. We also have a complete list of all upcoming training events for the coming months available. Are we not coming to a location close to you? Why not host then an Ensembl workshop yourself? For more details, please contact Xose Fernandez. 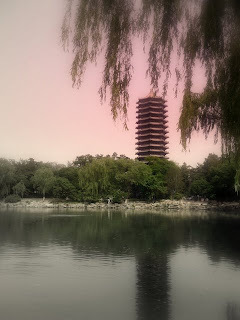 In Beijing, we were hosted by Professor Jingchu Luo from the Center of Bioinformatics at Peking University where we also delivered some lectures in the Applied Bioinformatics Course. Following this experience and due to the success of the tour, we are planning to go back to China. So if you were interested in hosting a workshop or you have a collaboration with a Chinese group who might be interested in knowing more about Ensembl, please contact us to discuss dates. We are trying to coordinate our next trip with different hosts. As ever, email us with any questions (or comments). Did you know? The EBI has released tutorial videos. Have a look at the Ensembl browser videos for information and direction to some of its pages! Or, learn more about BioMart, a fast data mining tool. After a very successful Ensembl US West Coast Tour last month, the Ensembl Outreach team is presently looking into the possibility of organising a similar tour on the US East Coast in the second half of 2008. At the moment we are mainly thinking of 1-day browser workshops, but if there is interest in an API workshop we can of course also consider this. The participating institutions would only have to pay the instructor’s expenses and would share the travel costs, but we would not otherwise charge for the workshops. People that are potentially interested in hosting a workshop can contact me for more details. Viral genes have been removed in multiple species. ncRNA updates will be ready for Pika and Mouse Lemur, and new variations from dbSNP 128 (mouse, chicken, cow, and zebrafish) and dbSNP 126 (rat) will be available. Have a look at the new pairwise alignments between human and horse genomes. A series of talks and workshops are happening in March. Interested in organising a course in Ensembl and BioMart? Contact our helpdesk. You might think that only our group and team leaders are traveling the globe, but also the members of the Ensembl outreach team (Xose Fernandez, Giulietta Spudich and myself) spend a fair amount of their time on the road (or in the air ….) to spread the word about Ensembl. I myself, for example, just returned back in the UK from a 3-week “Ensembl US West Coast tour”. That means no more Margaritas, motels with ocean view or trendy LA restaurants for me for a while, but also no more lost luggage or cancelled or delayed flights (it’s not all glitz and glamour …. ). My tour started with a visit to the Plant and Animal Genome XVI Conference in San Diego, where I gave a presentation on Ensembl and spent, together with other EBI colleagues, time in the EBI booth to promote our institute. After that I gave Ensembl browser workshops at City of Hope (see picture), the University of Oregon , UCSF, UCSC (where the audience mainly consisted of genome browser folks! ), and UCLA. Numbers of participants ranged from around 15 till over 50 and in all places the workshop was very enthousiastically received. In fact, several of my hosts were already asking when we could repeat this …. The principle aim of our workshops is of course to teach people how to get the most out of Ensembl, but apart from that it also is a really good way for us to stay in contact with our users. We can see what people exactly use Ensembl for, how they use it and what they like and dislike about it, so we always return back home with lots of new ideas and suggestions. One thing that, for instance, often strikes me is that most people are not aware of the existence of our data mining tool BioMart. However, after a short explanation and some hands-on exercises they find it almost without exception very useful! So, we still have some work to do to promote this very handy tool. By the way, we not only offer browser workshops, but also workshops on the use of the various Ensembl Perl API’s. Keep an eye on this blog to see where and when the next workshops will be. Or, even better, host one at your own university or institute! For more information with regard to our workshops you can contact our helpdesk. Interested in hosting a workshop? Contact us!